Apple sold 52.2 million iPhone handsets during the January to March period, which failed to beat Wall Street's estimate of 52.4 million. The figure was still higher than the 50.8 million units that Apple sold during last year's fiscal second quarter. Apple CEO Tim Cook, mindful of the rumors about sluggish sales of the iPhone X, said customers "chose iPhone X more than any other iPhone each week in the March quarter." Despite Tim Cook's claim about iPhone X sales, the company reported an Average Selling Price for the iPhone of $728 versus forecasts of $740. That would seem to indicate lower sales than expected of the premium priced anniversary model. Despite the lower ASP, revenue attributed to the iPhone rose 14% year-over-year. Apple also sold 9.1 million iPad tablets during the three month period, basically in-line with forecasts of 9.17 million units. Products like the Apple Watch and the HomePod smart speaker were mixed into the "others" category, which had $3.9 billion in revenue for the quarter. That beat analyst's forecast of $3.7 billion. Cook noted that wearables, which include the Apple Watch, had a 50% hike in revenue. Services, an area that Apple is said to be focusing on with the slowdown in smartphone sales, had $9.19 billion in sales during the quarter. That was sharply higher than the $8.39 billion that Wall Street was looking for, and could be a reason for the stock to continue higher in the days ahead. Revenue for the company topped estimates at $61.1 billion, and earnings per share also came in above expectations at $2.72 a share. And to help bolst the mood of Apple investors, the company said that its fiscal Q3 revenue will be in a range between $51.5 billion to $53.5 billion. Wall Street expected Apple to forecast $51.61 billion for the next quarter. The company reported growth in all geographic segments including a pop of 20% in Greater China and Japan. Cash on hand declined to the lowest balance since June at $267.2 billion. After hours, Apple shares soared 3.7% to $175.38. The high for the year is $183.50. And just like that, Wall Street's "full panic mode" over Apple is over. Just wait till this falls line up. they'll sell like crazy because of the new design. Just wait. (And I say this as an android fan and user). I personally know 5 people excited to upgrade because they'll be infinity displays and such. Someone said the same thing around this date last year.... And even the year before that. Proof isn't needed for something said so commonly on this site. You do seem to know little about smartphones though, judging from your post no.9. I could be wrong though. They very much did, claiming much bigger sales than was actually achieved. This "super-cycle" was to be down to the introduction of the new model all X, clearly that has fell way behind expectations. With an ASP of $728 and only the 7+ 128mb version and smaller 64mb 8 selling below this level it is clear that not even the second tier iPhones sold that well, let alone the iPhone X. What nonsense are you talking about??? lol. This so called "super cycle" claim invented not by Apple but those so called reputable analysts. So that claim has no credibility at all and nobody took it seriously anyway. Then the ASP. Last year ASP was in low $600 range. This year it has increased by more than $100 up to $728. In fact last quarter it was $796, have you ever even imagined such prices. Again it doesn't matter what wall street expectations are because they have no credibility at all. Android ASPs are in low $200 range, and who makes predictions about that?? Nobody even cares. This year there are 8 iPhone models in the iPhone lineup. That's the most models Apple has ever had. Tim Cook clearly said “Customers chose iPhone X more than any other iPhone each week in the March quarter", what all this means is percentage wise iPhone X was the best seller and revenue wise too maybe. Another important thing here is you can't put 8 and 8 Plus as a one model because iPhone X has no any Plus model to compete with. In summary Apple has done excellent this quarter compared to their previous quarters. That's the only credible measure we have in hand to elaborate how successful Apple did this quarter. Their every measure has increased including revenues, net profit, sales numbers, services revenues etc. Amazing at what they do. True that. They know how to take take advantage of the conditions and situations to maximize their profits. And we continue to pay more and more. No it isn’t. Do you think Apple doesn’t see iPhone sales stalling eventually? Of course they do, this is the company that came out with the iPhone right when MP3 players (such as the iPod) had hit peak appeal. They likely have several avenues of interest they’ll dabble in moving forward, including expanding their service gains further down the line. What avenues would that be? They seem to be letting their Mac lineup die, their concept for a VR/AR headset is so ridiculous it'll barely cater to consumers, the iPad hasn't been noteworthy in years and their core business of iPhones has been underwhelming with other flagship phones outclassing them and iOS is a damn joke. The rumored cheap 2018 iPhone X model is going to cannibalize the more expensive models in a bad way, but it's likely the only way the sales numbers will keep from dropping, even Apple knows that. Filing cases for patent infringement with several OEM's. Example, copying the notch design lol. Actually, the reason Apple beat earnings estimates is in large part due to their services beating the estimated revenue by about $1 million. This includes things like Apple Music. So, if it weren’t for Apple Music they probably would’ve done poorly. Also, the worry should be placed on the future of the HomePod since it is somewhat tied into Apple Music revenue by exclusively streaming it. If Apple doesn’t offer a more robust smart speaker offering, it could mean less incentive to get Apple Music over the competition in the future. Pretty good for the low iPhone X sales. The other iPhones must be doing pretty well. Low iPhone X sales? It has been the best selling iPhone model since it was release. Analyst was wrong once again. "Furthermore, Cook said that the iPhone X marks the first time its most expensive, flagship device has been its most popular device. 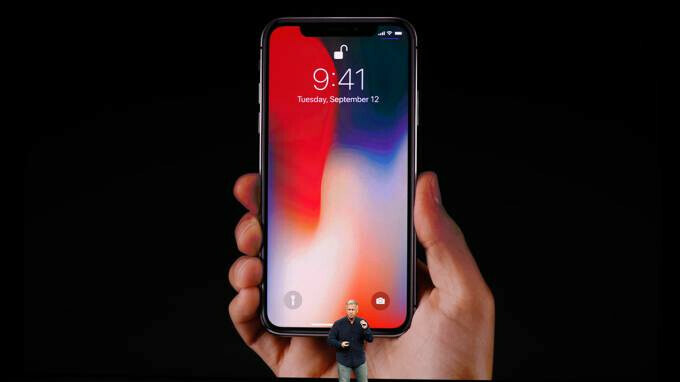 Cook said that Apple was "surprised somewhat" that the iPhone X was the most popular device each week since its launch. "That's a powerful point," he said. iPhone X was also the most popular smartphone in China during the quarter. " And the profit figure? Oh well Samsung had a better profit than Apple this quarter! Yes they did 14.5 billion USD from Samsung versus 13.8 from Apple. How much of that goes into your accounts? If the answer is "zero", than you're fighting a war that isn't yours. This year they had X model. One handset more than last year and yet they sold almost same ammount of handsets. Thst means something does not sell well. Last year weak demand was explained with waiting of anniversary models. So what is now their excuse? Why you think adding more phones automaticly means more people buying iPhones? Same people are buying them, now we only have to choose which one we buy, we don't buy two you know. With a fall of almost $70 on the ASP i don't care what Mr Crook says, the X is not selling as many units as he is saying. He had to calm the panicing markets somehow and saying the X is selling well is the easiest way. But it's down almost $70 on last quarter which is when the X was known to be selling well. X sales slow and ASP plummets. Of course X sales slow down? Just like iPhones sales slow down every year after holiday q. Overall iPhone sales are low compared to last q, just like every year.